I have an NBLP 7034 that has the labels reversed. Side I shows 7034-A and Side II shows 7034-B. The labels are flipped, Side I label is Side II on the record and vise versa. Has anyone seen this before? I have an NBLP 7034 that has the labels reversed. B side has A side label and vise versa. Has anyone seen this before? Just picked up the 180g reissue. Sounds fantastic, all instrumentation really shines. Classic album. So what is different from this respect the classics version compared to the 2015 version?? This is a great album but my sealed copy was incredibly warped. It's like watching waves in the ocean. Amazingly it plays fine. A friend of mine showed me this record. The cover just made me laugh at first but the music blew me away. 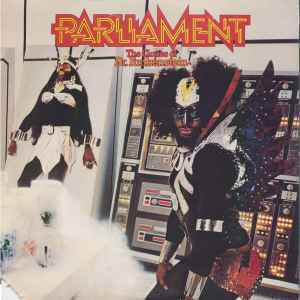 The story of this Parliament record is that the band took them self as being an Alien lifeform from outer space, and the mission was bringing p-funk music to planet earth. Nevertheless this record is the ultimate Parliament record for me. It is some seriously crazy stuff in there but incredible musicians are bringing the mothership ahead with Fred Wesley and Maceo Parker from James Browns band among some. Acid drugs were a big part in forging this music, and the result was P-funk at is best, yet humorous and fun. The highlight of the whole thing is "Dr.Funkenstein", just listen to the lyrics.. Classic! !